penumbra, originally uploaded by monkey_pushover_tree. 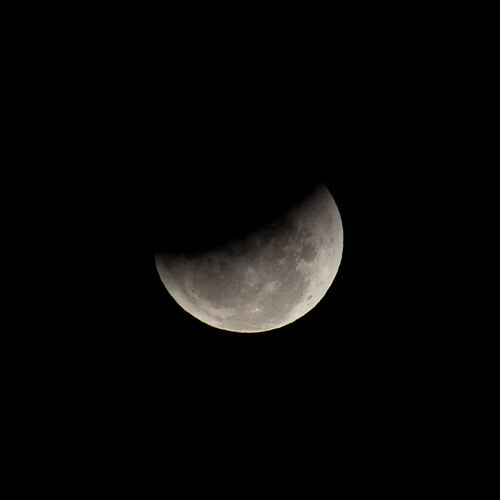 Partial lunar eclipse from Sydney. Interesting way to see the moon on the solstice. Last night on my cycle home, I decided to take a ride to Chatswood and back for some extra distance. It’s a fun route on the cycle paths and there is a nice hill just before Chatswood that you practice sprinting up. On the way back, heading through the dark cycle paths with my Ay-Ups lighting the way I spotted a bike light on the ground. The first thing that went through my head was that someone had a flat and may need assistance. I slowed down as I approached only to see a guy looking at piece of paper in the dark. He flagged me down and I stopped. First thing I asked was “Everything okay?”. Turns out he was lost and wanted to get to…Chatswood. Now while this route is straight forward when you know where you are going it’s not as much when you are in the dark and have never done it before. A confusing part of the route is a split in the path towards Artarmon. It’s even worse looking at it from a printout and trying to work out where you are in the dark. If you don’t know where you are going, you could easily go wrong here. So I offered to show him the way on the cycle path and then how to get to the train station in Chatswood. Another trip to Chatswood didn’t really bother me and I knew that you could get further lost if you hadn’t done the route before. So off we headed and chatted along the way. Turns out that this was the first day cycling home as he lives in Hornsby but works in the City.He was cycling back and forth to Chatswood which is cool I think. Part of your journey by train, the other by bike. So I delivered him within a block or two from the train station and headed back. Oh and he is the executive chef of a hotel in the city and said I should pop in and he’d sort me out with a feed! That’s pretty awesome! For me, I was just happy to help another cyclist. On the way back I got thinking; this would never happen with a car. Cycling does make people more friendly that’s for sure. Yes, the food bloggers. It’s harder than it looks to eat food, take some dam good photos and then write about the session that you’ve just had. Some may see it as a form of gluttony and pleasure all combined into one that anyone could do. But I’ve seen them work at it, it’s not as easy as it looks. By chance, I ran into a couple of my food blogger friends earlier this week after visiting the Chophouse in Sydney CBD. It was following this blog post by A Table For Two’s Billy that convinced me that should make a visit. An opportunity came up so we headed down there. The food is magnificent. It’s one of the few places I’ve been to where everything about the Chops and Meat you are eating is there right in front to you. All the way from the days it’s been fed to its Marble score. I ended up getting Dark Al Marinated Wagyu Flank for mains with Chocolate Tart for desserts. There was also their signature Swiss Milk Chocolate block, which is a delight to be shared. All of this would make me head back there again. The food is amazingly good; meat that melts like butter, sides with great flavours and desserts to die for. And that’s why I’m not a food blogger. I just don’t have the descriptive means that would do this food justice. I also don’t think I could eat all the time like these guys seem to do. And that’s the incredible thing about these guys. They are passionate about their food and spreading that passion to those that want to know. The industry is also beginning to notice this a lot more and taking note as to what these guys are saying. So back to these guys that I meet while I was at the Chophouse. They had been invited by Chophouse to experience a Pig and Pinot dinner. That slow roasted suckling pig carved by David Clarke, Executive Chef, at their table. The sight alone caused a stir within the restaurant, followed by the series of flashes going off everyone knew this was a major event. Luckily for me, my friends: A table for two; Grab Your Fork; chocolatesuze and here comes the food where present at this event. Thanks to those guys I got to experience the delights of this suckling pig (thank you to whoever sent over the plate!). Have to say, it was some of the best I’ve had in a long time. The crackling was perfect, crunchy full of flavour with not too much fat. It reminded me of the spit roasted pig that I’ve eaten in Germany but nowhere near the fatty taste you can have. The meat was tender and juicy just thinking about it again makes my mouth water. Now these guys got to experience the whole lot more and I highly recommend that you read their posts of the event to see it in full detail. As for watching them work. Whilst it appears that they are all eating, they are listening, asking questions, making notes. Watching between the conversations and laughter, there is the quick pull out of a iPhone and tap of note about some item they have just eaten or drunk. It’s amazing with all that food they consume they are able to polish together such articles, enticing the reader to head to that restaurant and experience the same. They may say it’s easy, but it appears not to this outsider. Whilst I’m lucky I’m able to enjoy watching these guys and occasionally join in with them, I think that’s maybe as far as I would get with my food blog. So kudos and respect to these guys, they know what they are doing and you should listen/read them. Jarod said the following to me over the weekend – “Cause [sic] you let your brain bash up your body”. It was reference to an earlier discussion about making decisions and the though process that goes with it. Earlier, for Jarod, it was just one more hill before he went home. For me it was I’ll just do another hour which turned into a total of 3 and 80km of riding that I wasn’t originally going to do. I wasn’t feeling the strongest this weekend and was more sleepy than anything and it was supposed to be a gentle ride just to make sure I did some riding. The problem is that the brain bash up your body comment on the bike rings true. It’s one of the only times in the sports that I’ve been able to do it. By some means I find ways of shutting off and ignoring the pain and suffering when on the bike. I know I’m pain and my body is screaming stop and rest but some how my brain takes over to shut it out. When I finally do stop I’m exhausted, I’ve given it everything and just collapse. The question is how how am I able to do this in some sports and tasks but not others? Why can’t I do the same thing when climbing and push myself just that much further? Why is it on the bike I’m able to do such a ride? I guess the brain is a complex machine and some things it allows me to do to exhaustion and others not. On the plus point, I did watch all of the Tour stages this weekend! I wish I could climb and descend as well as they do! There are two new elements in my world, Argon (Ar) and Krypton (Kr). Yes both are noble gasses and pretty much harmless. So why are these now new elements in my world? Well they are names of my frame and new bike! A full carbon machine. After a year and half riding the mendota, it was time for a change for riding at the weekend. The rides have been getting longer & longer. When I start a ride I’m now expecting to do at least 50km and it’s more like 70km when I’m done. The problem with doing this on the mendota is that it’s a lot harder than it needs to be to do such a distance. The Mendota is fantastic for being around the city and doing commuting. For distance and speed, it’s a lot of work. Cruising speed on it being comfortable is between the 25-28kmph. Most of this feels like an areo issue. You are quite upright so all the wind hits your chest and you have to push through this. Don’t get me wrong, it’s done me very very well and I’m still using it for commuting. So after a few months of umming and arring, I decided to finally bite the bullet and get a road bike. Now the question was did I stay with the aluminium frame with some carbon forks or go full carbon? After much talking to LBS employees and t’internet browsing I decided against the aluminium frame/carbon forks/rear stay etc. The main reason was that it seemed that it wasn’t really much of an upgrade over the Mendota. Okay, yes I would be more areo, but other than that not that much. The next step up was to go full carbon; light, ridged, areo and a full group set. In the end I settled for a Argon 18 Krypton 36. The other thing I got was a the SRAM rival groupset. The big reason for going for this groupset was that the brake levers remain just for braking only. There is none of the movement that is there with the shimano setup. The double-tap feature of the SRAM groupset I find awesome. It’s noisy and there is nothing subtle to it. It’s very much like a car’s racing gearbox. It’s either in gear or it’s neutral. I like it very much. As soon as you touch the gear lever you’re changing gear. There is a pleasant thunk that you hear, reinforcing that you’ve changed successfully. The other big step up for me is that this isn’t a compact chainring. This is 53/39 on the front. This is a bit different to the 48/36/26 on the Mendota. The difference being is that when you turn the crank, it feels like all of the power is going directly out of the back wheel. So far, this setup hasn’t been an issue. In fact, I’m now 5-10kmph faster up some of the hills I have been running on. Even on the one 10% hill that I’ve been on it’s not too bad. Most of the hills have been between 2-6% and this bike climbs them without an issue. I do wonder what I’ll be like on the longer hills. Judging the distance/effort required for these is still tough for me. I’m also coming to grips with the speedplay pedals. They are harder to get into than the SPDs, but once they are in they are solid. The main reason I think they are harder is simply due to the size and the carbon/fibreglass boot. You need to make sure you are really over the top of them and push down firmly. I was told they will ease up, and they are doing so. I certainly like them when I’m standing out of the saddle as they feel much more secure than the SPDs. Things I do need to work on, cornering at speed and descending. Corning on this is harder than the mendota. Yes I know I need to counter steer, buts that’s harder said than done and getting used to the bike to that at 35kmph is a bit nerve racking. I’ll get used to it I’m sure. Descending on this is nothing like the mendota. I’m not 100% happy yet on being on the drops at speed. I’ve hit 65kmph so far on this bike, and I feel I can go a lot faster which is scary. I guess I’ll have to get used to that too. One thing I do miss on this is the disk brakes. The disk brakes on the mendota allow you to stop on a dime, they are sooooo good in any condition. Callipers on the other hand…I think it’s going to take a bit of wearing in and knowing the distances I’ll have brake on with these. Yes, that’s a lot of white. It’s not that hard to clean given that’s I’ve cleaned it once already after a damp ride. So far I’ve covered 228.75km on it. I suspect that I’ll be seeing a few thousand kms on this that’s for sure. morning:mist, originally uploaded by monkey_pushover_tree. 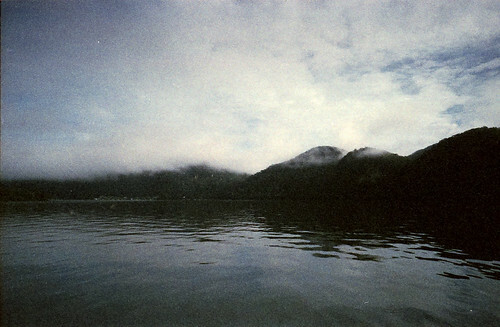 I love film. It’s even better when you forget what you have taken and the damage from x-rays and heat produce something better than you’d hoped for originally.